The Mayans. 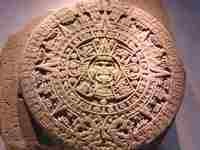 The Mayans developed astronomy to the point where they could predict eclipses hundreds of years in the future. Their legends say they obtained their astronomical wisdom from the Olmecs. Little is known about the Olmecs, though traces of their culture have been found dating to about 2000 B.C.E. A Mayan stone calendar is shown at left. The Mayans and Aztecs have a legend of learning great things from a bearded "white man" who came to them sometime after 500 B.C.E. The Aztecs named him Quetzalcoatl, which means "Plumed Serpent." There is some speculation that Quetzalcoatl could have come from Egypt, and that the "Plumed Serpent" represented the cobra with its hood expanded. Mayan legend says that the Yucatan was originally inhabited by "people of the serpent," and their leader's name was "Serpent of the East." Mayans claimed that they got their writing from the Tula, and that their leaders sailed over the sea to the East to learn their wisdom. Mayans counted using a base 20 system. Their numbers used three symbols: a sea shell for zero, a dot for one, and a bar for five. They also had a small curved symbol that served as a filler around a small number of dots, for aesthetics. A Great Cycle, or Age, is also known as a "Sun." Their legends state that at the end of each Sun there is a catastrophe, followed by a renewal. They count time in a cycle of five Suns, which therefore spans 9,360,000 days, or about 25,627 years. Some cite this Five Sun cycle as evidence of Mayan knowledge of precession of the equinoxes. Mayans believed that we are currently in the Fifth Great Cycle, which will end, and a new First Sun begin, on 23 December 2012. Popular literature abounds with speculation on this event, and its near-coinciding with ecliptic crossing to the north of the Solar System's orbit around the Galatic Center. The Mayan Vague Year Calendar (Haab). Mayans knew that the length of the Solar Year was about 365.25 days long but, like the Egyptians, they used a calendar of 365 days and did not use leap years. Because this calendar does not follow the true Solar Year, is is referred to as the Vague Year calendar, or Haab. The numbers 1 through 13 increased along with the days. So for example the first day in the cycle was 1 Imix, the second was 2 Ik, and so on. After 260 days, every combination of name and number (1-13) would repeat. The Mayan "Calendar Round." Every 52 years, the Vague Calendar and the Ritual Almanac coincide at the same beginning day. The Mayans called this a Calendar Round. They considered this an auspicious time, where the old would end and the new would begin. They rebuilt houses, refaced templed, and performed other such acts on this day. This custom has allowed us to accurately estimate the ages of many of their temples. Mayans followed a longer cycle of 22 Calendar Rounds, consisting of 13 Heavens (the first 13 Calendar Rounds) followed by 9 Hells (the last 9 Calendar Rounds). The last cycle completed in 1987, placing us now in the first Heaven. Lost Mayan Culture. Today, much of the ancient Mayan culture is lost forever. Their beliefs conflicted in many ways with the Roman Catholic Church, and the first Archbishop of Mexico claimed to have burned tens of thousands of Mayan books in the 1500s. Apart from remaining temple inscriptions, only four books remain today as the remnant of this ancient culture: the Dresden Codex, the Grolier Codex, the Madrid Codex, and the Paris Codex.